DJ and producer Calvin Harris has made chart history after becoming the first act to score eight top 10 hits from the same album. The 29-year-old Scottish star clocked up his latest hit this week when his collaboration with Ellie Goulding, I Need Your Love, rose to number seven in the charts. The song, from his album 18 Months, lifts Harris above Michael Jackson who achieved seven top 10 hits from his 1987 album Bad, and another seven from 1991's Dangerous. Among the hits from his impressive run are two number ones - We Found Love with Rihanna and Sweet Nothing featuring Florence Welch. The album has sold more than 543,000 copies in the UK since its release in October. Other acts who have come close to the record include Jessie J, whose debut album Who You Are contained six top 10 hits, and Take That whose 1993 album Everything Changes yielded six top 10 singles. The five members of Backstreet Boys were brought to tears as they unveiled their star on the Hollywood Walk of Fame. Former chart star Sandie Shaw has revealed she and fellow singers such as Cilla Black would occasionally wear each other's underwear by mistake. Union J's George Shelley has vowed to sit naked in a bath of baked beans if the band's debut single Carry You gets to Number One. 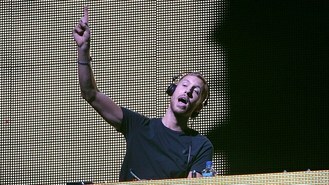 Calvin Harris got a soaking while he was DJing at the weekend when a member of the crowd threw a drink at him. Lauryn Hill's sentencing for tax evasion has been delayed to give her time to pay the money she owes and avoid jail. Pete Wentz has revealed Fall Out Boy want to encourage their female fans not to want to be groupies. Choirmaster Gareth Malone is to lead a national talent hunt for his next challenge - to recruit a group of young people and inspire a whole generation.